Be a part of one of the most exciting, educational, and personally rewarding experiences imaginable! 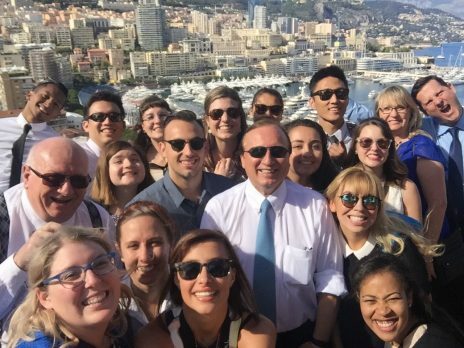 The School of Hotel and Restaurant Management at Northern Arizona University offers an array of study abroad trips – a chance to earn college credit while living and traveling overseas. Learn more about our programs offered below. Two of our most popular trips are the Discovering Gastronomy trip and the Summer Study in Europe trip. For other study abroad options, visit the Center for International Education’s page. A three-week, three-credit course in France beginning in late May through mid June. In addition to kitchens, hotels and wineries, students will be visiting historic towns and cultural landmarks. The main objective of this course is to provide students with a meaningful understanding of how the French people weave their daily food/beverage connections into their everyday life. The lessons from this program will give students the framework to better understand how to make connections with our culture and apply them to their future leadership roles. Check out a student made video of the trip! Students will be able to earn 3 NAU credits for HA 499 – Discovering Gastronomy: A Study of French Terroir and Tradition. This course may be applied to HRM requirements as an elective. The course will include online content. The program runs from the end of May until the middle of June. The 2019 cost of this program is expected to be approximately $5,500. This includes NAU tuition and fees, the $100 application fee, accommodations, in-country transportation, excursions, international health insurance, and some meals. Apply for a scholarship to help with the direct travel costs for this trip! Download the application here! Applications are due April 4th, 2019.
gastronomic centers of France from late May through mid-June each year. The program will highlight restaurants, hotels, producers, and French specialty products including: cheese, bread honey, nougat, wine and mustard. There will also be a reunion/re-entry dinner towards the beginning of the next academic school year to reflect and share experiences and memories. During this program, students and staff will be staying in Ibis hotels at the various destinations. We will be renting vehicles for in-country transportation through our route up to Dijon, as public transportation will not accomplish our goals for this portion of the journey. Once we reach Dijon, we will be taking a train to Paris and using public transportation systems to reach our remaining destinations. This program will be led by Professor John Cauvin, native of Nice and experienced hotel and restaurateur; and Chef Mark Molinaro, who has over 20 years of cooking/teaching experience under classically trained French chefs. Summer study with a European flair. A five week, six credit summer experience. Be a part of one of the most exciting, educational, and personally rewarding experiences imaginable. 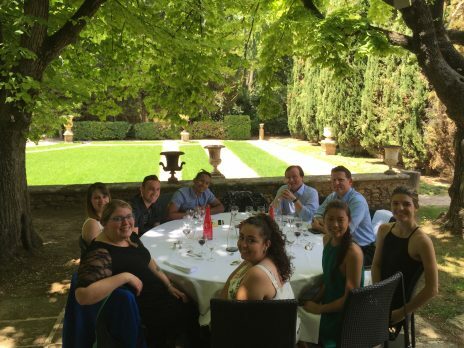 The School of Hotel and Restaurant Management at Northern Arizona University offers a Summer Study in Europe program every other year – a chance to earn college credit while living and traveling in Europe. Study at NAU Partner Schools in the Netherlands and Switzerland. Learn about Europe–the people, the customs, the nature of the European hospitality industry–while traveling throughout the continent. Applications will be available the year of the trip through the Center for International Education. Participate in two (3) credit-hour upper-division courses (HA 494 and HA 495) for which there are no prerequisites. Classes meet from three to four days a week during the five-week program with the remainder of each week devoted to travel. You will be introduced to the major cuisines of Europe, including those of France, Italy, Germany, Spain, Greece, and Switzerland. Each cuisine is examined in terms of regional customs, menu planning, preparation, presentation, and service. Lectures are supplemented with laboratory sessions taught by European instructors. Students taste and evaluate the various cuisines. Topics include transportation systems, the tourism infrastructure, political considerations, the impact of the European Economic Community, and the impact of the changes in Eastern Europe. Emphasis is placed on immersing the student in the European style of hospitality and travel. Students must make their own arrangements to arrive in Europe. For informational purposes, the round-trip airfare at the time of this printing is estimated at $1,700. Please contact program leader prior to purchasing your airline ticket. Students will apply online through the Center for International Education. Deposits and all fees are billed through LOUIE. Non-Refundable Application Fee: $100 is billed at time of application. This is charged along with a $500 deposit once the student has been admitted to the program. The remainder of the application fee will be billed closer to the end of Spring 2016 semester. Applications will be accepted on a first-come, first-served basis, although consideration will be given to academic achievement. A minimum GPA of 2.25 is generally required. NAU’s Center for International Education requires that all faculty-led international program participants have minimal travel/medical insurance, the cost of which is included in the program costs. You may wish to review the coverage of this insurance, and obtain additional coverage, if you think that will better meet your needs. Cancellations will result in loss of application fee, deposit, and any payments made on your behalf that are not refundable to CIE. Should you cancel, this will increase the cost of the program, or possibly result in the entire program being canceled. The university reserves the right to cancel or postpone any course or activity due to insufficient enrollment or any unforeseen circumstances. In the event the program has insufficient enrollment to be viable, a cancellation decision would be made by Monday, April 11, 2016, and all deposits will be fully refunded. The first half of the program will be based at Breda University of Applied Sciences (NHTV) located in Breda, Holland. NHTV is the foremost institution in the Netherlands for tourism and hospitality studies. Breda, a town of about 110,000, is located 50 miles south of Amsterdam. The city of Breda is a pleasant blend of history and youth with its 16th century roots and its 20,000 students in residence. Breda serves as a convenient hub from which to visit most of Western Europe’s capitals: Brussels ~ 2 hours; Paris ~ 4 hours; Copenhagen ~ 8 hours; and Berlin ~ 6 hours. The second half of the program will be based at the École Hôtelière Les Roches located in Bluche, Switzerland in the heart of the Alps. Bluche is one kilometer from the ski resort of Crans-Montana and less than two hours from Zermatt (home of the Matterhorn) and the metropolitan Swiss cities of Montreux and Lausanne. The Les Roches Hotel School is a member of the internationally respected Swiss Hotel Association. Its reputation attracts students from all over the world. Switzerland itself is world-renowned for its beauty and cleanliness. The Swiss people are friendly and supportive and enjoy meeting American students. Virtually everyone speaks English (as is the case throughout Europe). Additionally, the fact that Switzerland is a neutral country has made it one of the safest places in the world to visit. Students will stay in double-occupancy rooms. Each room has its own fully appointed bathroom. Lodging is provided for all the days during which students are actually in the program. If, on travel days, students wish to stay at the school and take day trips, their rooms at Le Roches are always available. On class days, breakfast is provided. A complete lunch will also be provided, which will feature many European dishes. Experience has shown that students would rather be on their own for dinner. There are many restaurants close by featuring menus ranging from fast-food to gourmet. This program will be led by Professor Kathleen King. Professor King has helped lead the trip on five different occasions and has some amazing contacts throughout the cities visited.